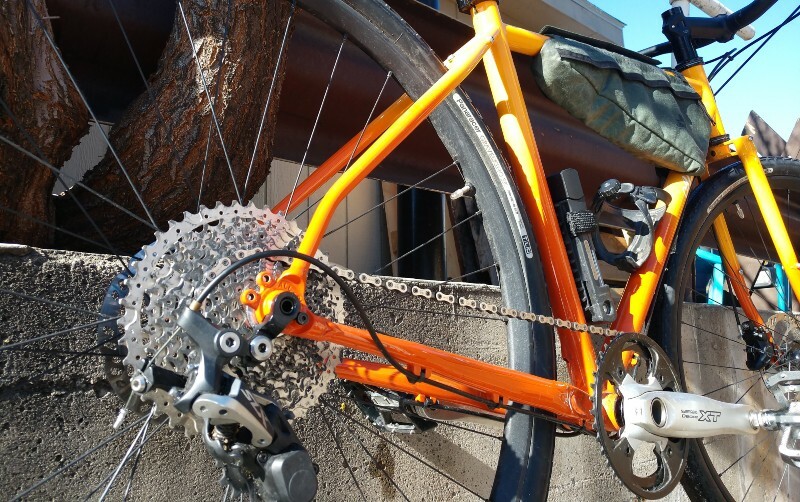 The folks at All-City debuted a new bike last year, and it has become a staff favorite. Killian built one up with 650b "road plus" wheels, I ride mine to work all the time, and Adam has one on order. Since we just officially became an All-City dealer, I thought I'd share why my Gorilla Monsoon has become my most-ridden bike. An occupational hazard of every bike shop is that we see so many bikes that we want everything. I love the look of vintage bikes, but want modern features like thru-axles and disc brakes. I want high-performance mountain bike parts (because they're just durable and awesome), and I want a rack and fenders. I want big tires, but sometimes I don't. I want a bike to lock up outside a grocery store or bar, and then confidently haul a load of food or other gear home, swiftly, no matter what route I choose. Sometimes I go on a quick city ride, other times I'll go pass hunting or even head out for a camping trip, and I don't want to be turned around by bad weather. For me, finally, the Gorilla Monsoon is the "performance hybrid" we've all been joking about, and I love it unironically. Sure, two or three bikes would probably do their respective jobs a little bit better, but living in a small apartment, every bike has to justify the space it occupies. My other bikes, one all-road and one overbuilt trail bike, are wonderful in the right clothing and on the right surfaces. 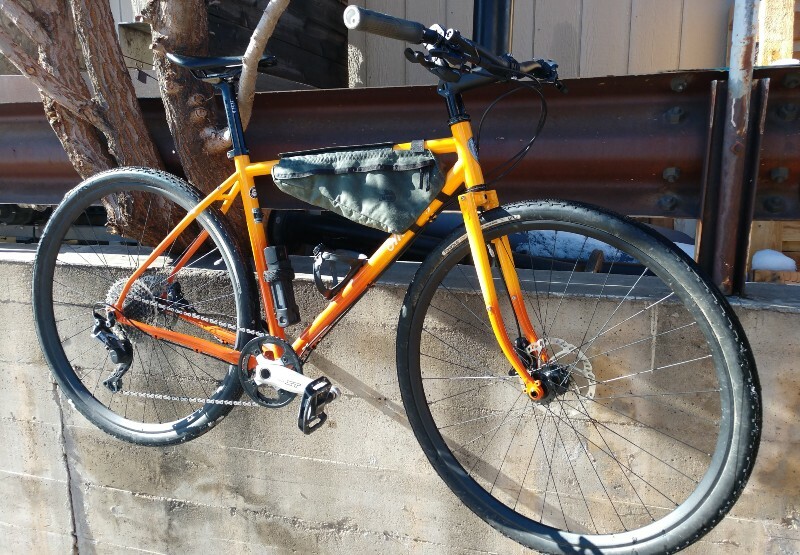 The Gorilla Monsoon occupies the entire range of everyday cycling between the other two as my four-season commuter, bikepacking rig, party bike, gravel rambler, and singletrack underbiker. Salsa Rustler Flat Bars: Yep. Flat Bars. So hot right now. Shimano 1x11 drivetrain and brakes. Panaracer GravelKing SK 38mm tires for the winter, but will roll on something slicker once the roads are reliably dry. The ED Rust protection that covers their steel inside and out. This is catching on in the industry, but All-City was among the first to apply this treatment to their frames, and it really does help them last longer. It's good to have something that's made to last for decades. All-City doesn’t plaster their frames with marketing, leaving off even the model name. They don’t follow the same model-year based marketing that other brands do, so you’re never riding last year’s bike. In fact, their paint schemes are limited to a couple rounds of production, so good luck getting that dreamy tricolor fade your buddy picked up last spring! Luckily, every new scheme is drool-worthy and holds up very well. Every bike is made available as a complete build (which is the best value for customers) or as framesets for us industry people (or DIY types) who enjoy building a completely unique bike. 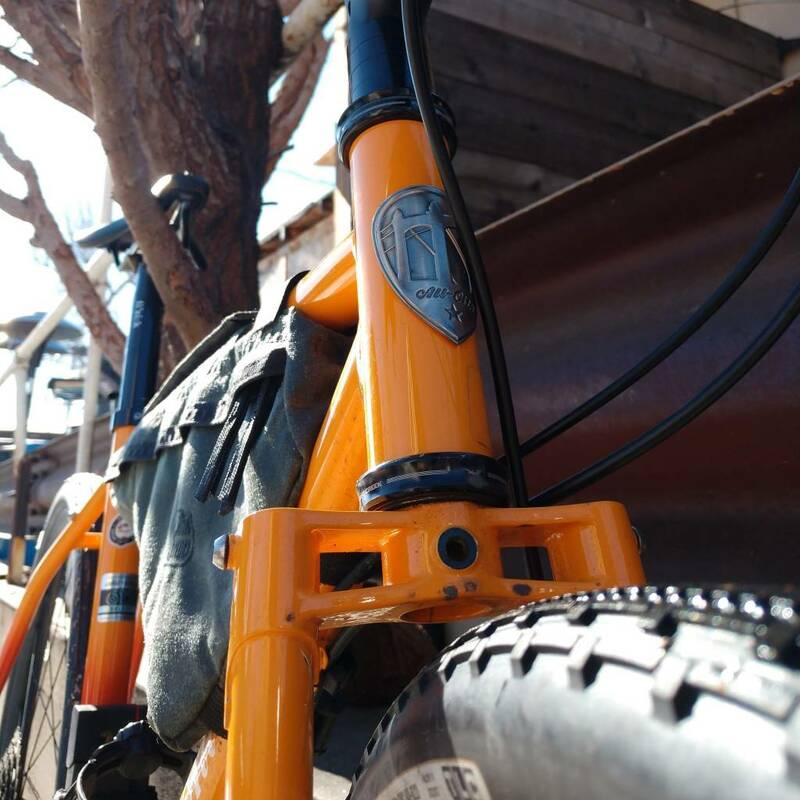 Even though all of their bikes are quite versatile, All-City makes a pretty complete lineup of bikes that are geared towards varied types of road riding, from the dirt-heavy Gorilla Monsoon to their track bikes. It's a more realistic middle ground between the way some other companies market their bikes, either telling you to buy a dozen hyper-specialist bikes, or promising that one bike can do literally everything with no compromises. This is all to say that enough of us have been digging All-City enough that we're going to start carrying their bikes in store, so if their bikes' philosophy (or their looks) intrigues you, stay tuned! 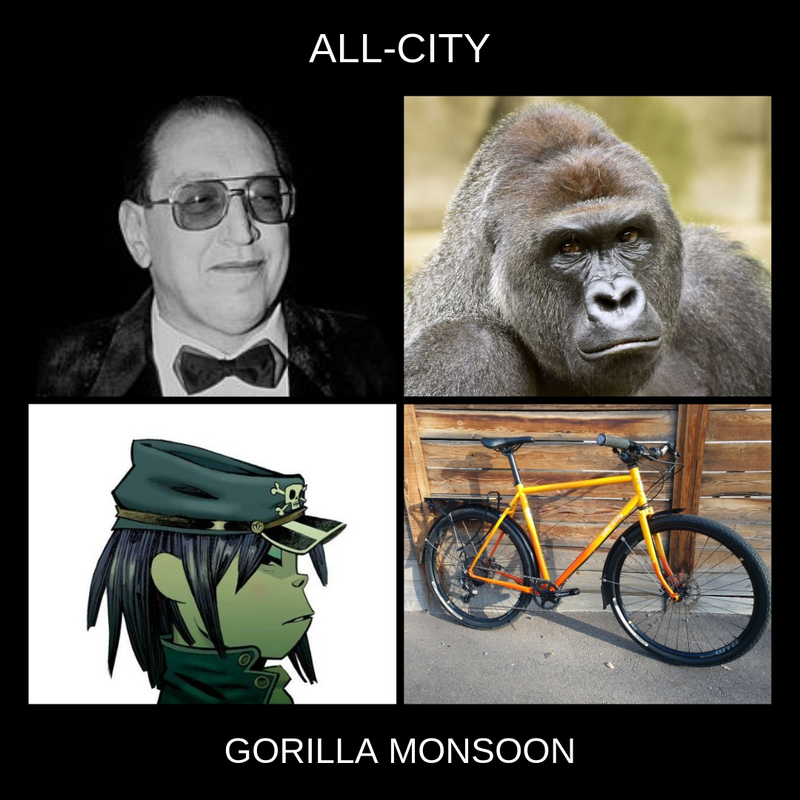 Other famous Gorillas, clockwise from top: Gorilla Monsoon, Harambe, Killian's 650b build, Noodle.